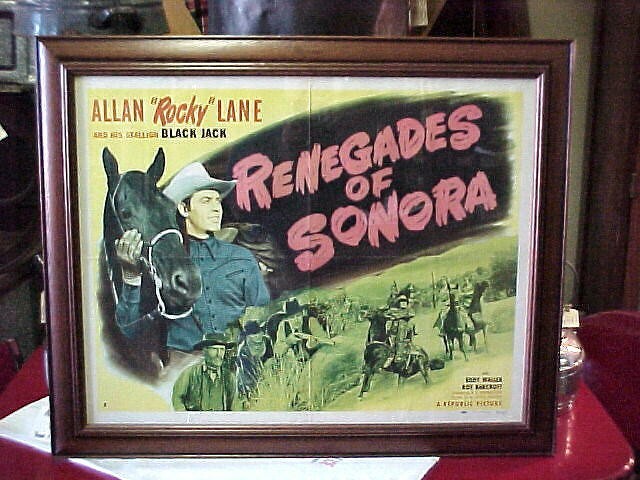 This is an original movie poster staring Allen "Rocky" Lane and his horse Blackjack. It is professional wood frame approx. 25x32. The Renagades of Sonora. Great for Home Theater. This is an original movie poster staring Allen "Rocky" Lane and his horse Blackjack. It is professional wood frame approx. 25x32. The Renagades of Sonora. Great for Home Theater. Please email cowboycabin@centurytel.net with questions or call 406 270-2842.